My lovely wife, who also happens to be my best friend and business partner, has been vacationing with our daughter for the last week in upstate New York. 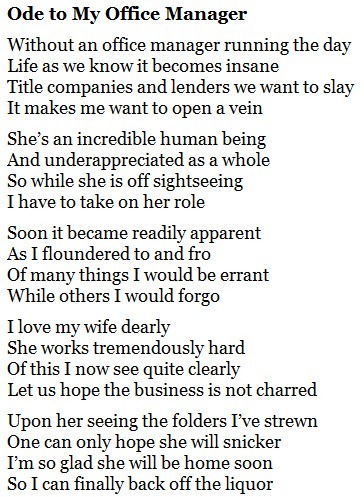 I am flipping crazy about the woman, and I miss her terribly (and my daughter too of course). As many readers know, Francy is also the Office Manager for our real estate brokerage. Yes, yours truly has been running the entire operation alone for the last week. We’re still solvent. I don’t *think* I’ve done anything that will get us sued. None of the agents have revolted or left the brokerage (though a couple are patiently waiting on checks). What I have realized in the last week is just how hard my wife works. And how much she knows. And how vital she is to the success of our brokerage. And how much I need her ”“ not just professionally, but personally. I’ve moped around the house like a kid with a lost puppy. I feel like I’m missing an appendage. I need my wife. And now you know why I don’t write poetry. Though technically that mess above meets the qualifications of being a Horatian Ode in a ABAB rhyme scheme, clearly Horace would not be amused nor impressed. There are no words to express how hard Francy works, and how fabulous she is. I honestly don’t know how she does it; I suspect she doesn’t sleep. Ever. Thanks for all you do Francy. We’d all be utterly lost without you. PS – I can wait for that check for several more weeks if need be. 🙂 Settle things in the house & home first. Your man’s getting pretty punchy without you! What a great tribute to not only those that support us real estate professionals in the office, but also those that support us at home. You are both lucky to have one another. Jay, what a very nice poem you’ve written. Now you can add the title of Poet after your name. By the way, that’s Jamey Turner, the glass harpist in the YouTube video you posted. He plays right here in my hometown of Alexandria, Virginia. I’ve watched him play many times down by the waterfront in Old Town Alexandria. For all I know, that could be me saying “WOW!” in the video. The guy is phenomenal! Nice work, Jay. Had you not proven to be so successful in real estate, a career in poetry would have beckoned you. Happy 4th of July. It is great to see a husband and wife being business partners and respecting and supporting one another so much.